Lonely Planet in shocking author admission of plagiarism and corruption. Roman catacombs, Civil War destinations, and more airline bankruptcies. It's a 'fun' week in travel. In a massive blow to guidebook publisher Lonely Planet's reputation, one of their writers admits to not even having visited Colombia, a country he'd written a guidebook about. 'Travel' writer Thomas Kohnstamm, author of Lonely Planet guidebooks on Brazil, Colombia, the Caribbean, South America, Venezuela, and Chile, admits that "he plagiarized and made up large sections of his books." He also accepted free travel in a direct breach of Lonely Planet editorial policy. 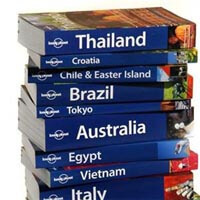 So much for truth in travel writing and relying on Lonely Planet books! "They didn't pay me enough to go to Colombia. I wrote the book in San Francisco. I got the information from a chick I was dating - an intern at the Colombian consulate," Kohnstamm also stated. Of course, he also has a new book to push right now, which makes the whole story even less palatable... Lonely Planet has stated that they've found no inaccuracies in Kohnstamm's writings, which is a bit rich. More at Reuters. Personally, I gave up on Lonely Planet guidebooks a good while ago, in preference for the Time Out guides or Moleskine City Notebooks. Richard Callaby at Viva Rome! writes about the amazing catacombs where ancient Romans were buried. I've been to the catacombs in Paris, but these are even larger and older. Mazes of underground tunnels were used to bury thousands of bodies in several parts of Italy. Check out the Roman Catacombs at Viva Rome! Intelligent Travel covers some interesting Civil War destinations in A Colonial America Trifecta. These places are within driving distance of Washington D.C. and would make a great day out. Air travel is quick and convenient, but what happens to airplanes once they're taken out of service? They're taken to a graveyard for airplanes and slowly broken down and recycled. Here are a gallery of great photos from an airplane scrapyard. Another U.S. low cost carrier bites the dust. Frontier Airlines filed for Chapter 11 on April 10, although operations will continue as normal for now. What's with America and failing budget airlines, anyway? Hollywood stuntman to sail Atlantic in popsicle stick ship. More on that nutty endeavor over at Gadling or this Reuters piece complete with video. Apparently, his "15-meter ship made of 15 million ice-cream sticks, that looks like a replica of a Viking ship." If you have a Canon digital camera, you can unlock a number of really useful features with a hacked version of the camera's software. With the CHDK Firmware (Canon Hacker's Development Kit) you can get faster shutter speeds, super-long exposures, battery read outs, etc, that aren't possible withthe Canon-supplied software. Even better, in cameras that the CHDK will work for, you will also be able to save your files in RAW format, which allows for much better quality after conversion in Photoshop. Learn about CHDK here. In a sad and romantic event, a couple in Texas that had been married for 73 years passed away on the same day. They'd gotten married just after meeting back in 1932 and their wedding was on Christmas Day. The whole story is here. Last week's Carnival of Cities over at Family Travel included my article Trajinera-ride in Xochimilco, Mexico City. As mentioned before, Wednesday will see the next installment of this carnival here at eyeflare.com. If you have an article about any aspect of a city, you can submit it to the carnival's submission page. The deadline is Tuesday 15 April at noon US Central Time. If you have any great travel articles or fun and strange links to share, please email me here at jack@eyeflare.com or drop a line via our contact form. Last updated by jack on 04 October, 2016 in Reading.